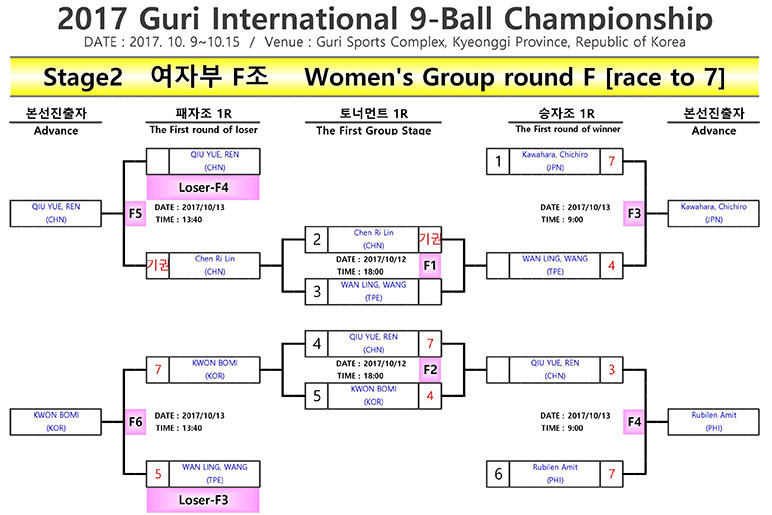 2017 Guri International 9-Ball Championship is set to kick off tomorrow in Guri city, Korea. This is the first WPA event to be held in Korea. The event is hosted by KBF and it will take place at Guri Sports Complex from October 12th-15th for the main stage. After three days competition of the qualifying tournament, the all qualifiers from men and women division filled the list of the tournament. The main tournament starts 12th October and the final is 15th. 64 men players and 48 women players will be put into groups and apply double elimination format until men’s last 32 and women’s last 32. Until then the game changes from race to 9 for men and 7 for women, to race to 11 for men and race to 9 for women with alternate breaks. A total of KRW₩ 191,600,000 prize fund are at stake with KRW₩ 30,000,000 going to the winner alone while the runner-up will receive KRW15,000,000 in both Men and Women division. For the live stream, live score, brackets…, the all info can be find on official system’s app “Billizone“. You can download the app on the App Store for iOS devices or on the Google Play for Android devices. There are total of 14 tables for this tournament, all 14 tables are live streamed and can watch via on the app “Billizone“. However, the TV table is live streaming on YouTube. The single elimination of 2017 Guri International 9-Ball Championship will begin at 10 am local time. The format will be played with Race to 11 for Men and Race to 9 for Women with Alternate breaks.